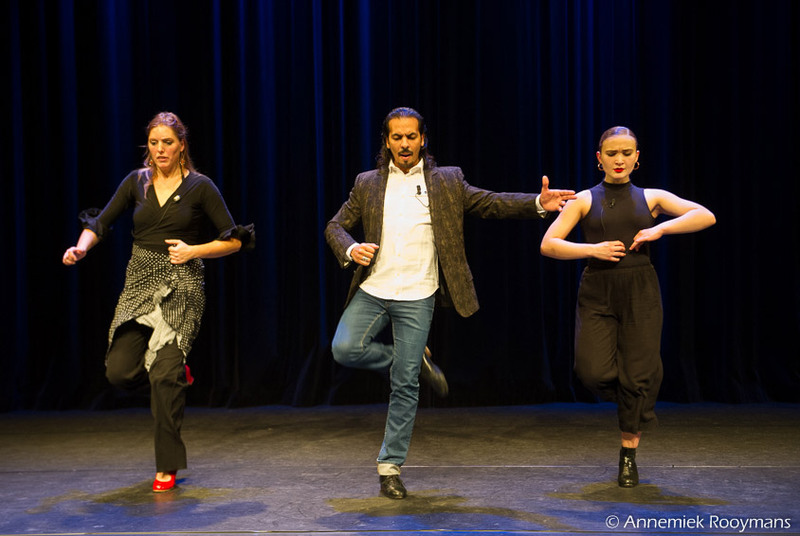 One of the most interesting things offered by the Bienal de Flamenco de Países Bajos is the master-class, conceived in the line of those offered by classical musicians. These are classes offered with an audience and in a theater, where a performer teaches and several students learn under the gaze of a paying audience. Juan Manuel Fernández Montoya, “Farruquito”, offered two in this edition, one in Amsterdam, and the other in Utrecht. His teaching served yours truly to confirm certain things. First: that flamenco also has groupies who spend whatever it takes to be close to their idols. Second: as with everything in life, one good teacher is worth a hundred mediocre ones. And third: any teacher worth learning from will never just explain things by the book. And to be sure, the dancer wasn't there just to teach a couple of steps. He talked as much as he demonstrated, he was like a teacher with something of the showman, and afterwards he told me how much one of the students had made him suffer. The girl was more nervous that he would have been for the debut of a new work. He took charge of things, a behavior the dancer practices with certain regularity. Such as the night before at the Teatro Carré. The class, despite a few rough spots, followed its course. The RASA auditorium of Utrecht was nearly full. A lesson in art, technique and life. This is customary in Farruquito, he tells it like he feels it. As he himself was taught. For this reason nearly all his performances seem like gypsy pronouncements, that serve equally well to execute a clever step, as to navegate through the rough waters of life. “Don't be in a hurry”. “The important thing is to know everything, without using what you know”. “Dance the way you walk, dancing has to be natural”. “Don't rush, take your time”. 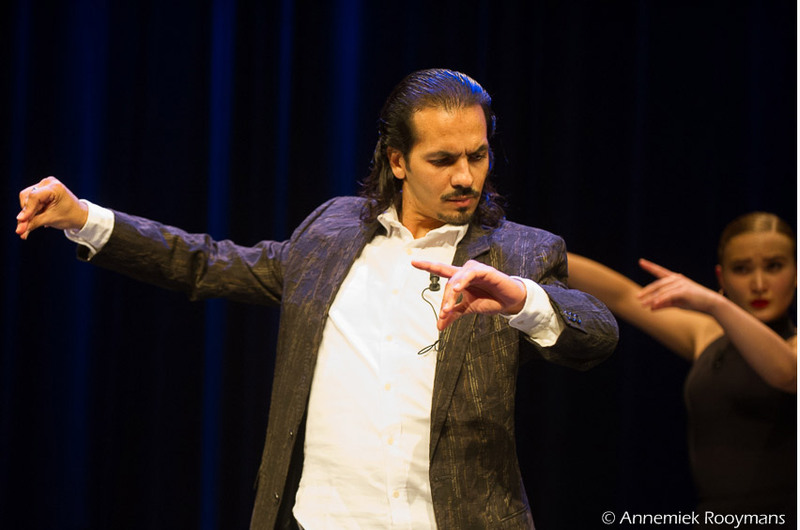 “Flamenco dancing wasn't born in the studio with a mirror. You have to look for the rhythm inside yourself”. “Come out walking, not dancing. Start dancing when your body tells you to”. “Never, never ever be in a hurry”. He said many things, and of course, this selection of phrases can make him sound like a nut-case. But he's not. No one with a sense of humor tends to be one. But the selection shows his insistence on certain concepts that he repeats, speaking and moving, in and out of the classes. Calmness is one thing, searching is something else. In this lesson, he began and ended dispelling the concept of speed, while “searching” was the verb he most repeated. The message was clear. In all those sentences, maxims and teachings, Farruquito was talking about flamenco, but depending on how he arched his eyebrow, he could be talking about something else. He knows it, it's not that he lets himself be carried away by the moment. Not with what he says, nor what he does. Improvisation is rehearsed, anyone who goes on stage knows this, but the force of his classes, of his shows and his appeal come from his belief in everything he says. Often getting it right, other times not. 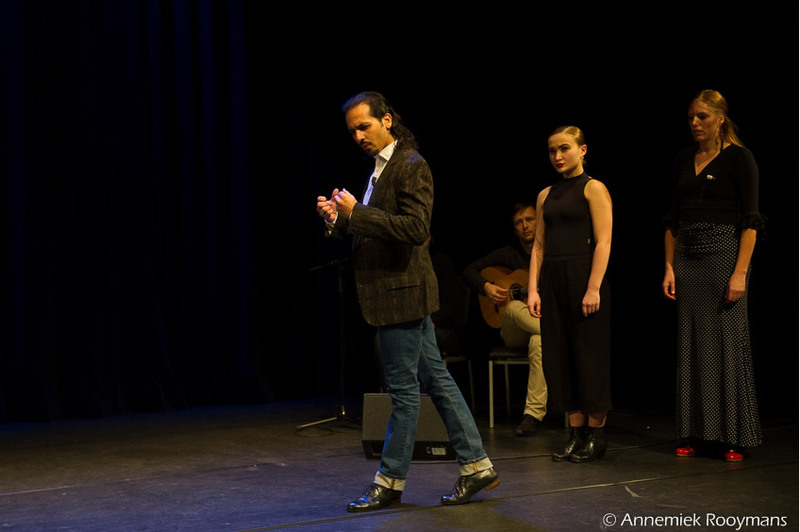 When it was over, we took advantage of the trip to TivoliVredenburg where Ultrahigh Flamenco was going to perform, to talk about things and wrap up another interview we had pending. “It hurts me right here” he said at one point while grabbing his throat with the right hand. And in my head, like a flash, an animal appeared pulling a big cart. I didn't answer, we don't have that kind of relationship. Instead, I let out a phrase that, being his own, seemed less intrusive: “Well, you know, the body remembers things”. Accustomed as he is to loading his words with various levels of meaning, he did the same thing with mine and looked at me like a jaguar. Neither aggressive nor fearful. Like a jaguar, that's all, for a moment that lasted a second and during which Juan did not seem to be Juan, but his grandfather. Then immediately he half-closed his eyes, and nodded, smiling. Then he took a deep breath and seemed relieved. I'm sorry, I wasn't able to get a word out of him at that moment. But believe me, I'd never before seen such an eloquent arching of the eyebrow.